What should have been a cut and dry application approval for the Cape Charles Wetlands and Dune Board, instead turned into what could have been a farce written by Dario Fo. This application is associated with the proposed development of a yacht provisioning center, on a project area totaling approximately six and one-half (6.6) acres that will be constructed on what has been known as the ‘Tavi’ property. 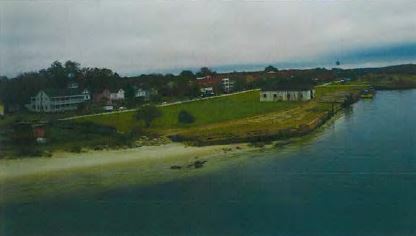 The site is now a vacant lot (formerly a ferry dock and seafood off-loading facility) on the north side of Cape Charles harbor in the harbor zoning district. The application was fairly straightforward, including a project narrative and scope of work, maps and area calculations of impacted areas, cross-section drawings of revetment stone and project area, photos of existing conditions, and comments from the Virginia Department of Health, and the Virginia Marine Resources Commission. The engineering firm of VHB is handling the project. 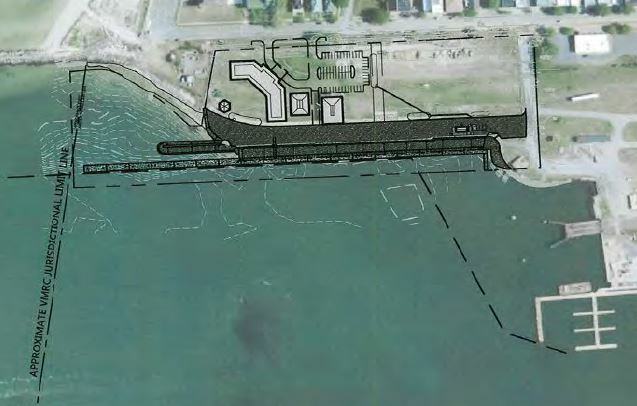 Mechanical dredging is involved, no additional hardening of the shoreline is proposed, but revetment stone is proposed to be set in front of the existing steel bulkhead. • A total area of approximately one-thousand one-hundred and eighty-eight (1,188) linear feet of concrete floating dock is proposed just north of the federal channel. • Revetment stone will be placed in front of existing sheet pile wall (bulkhead). • Approximately thirty-eight thousand (38,000) square feet of riprap material will be placed below the mean low water elevation onto sandy bottom. • Construction materials include: thirty-six (36) inch pipe pile; filter fabric; granite quarry stone; and sand fill. • Dredge equipment will be working in the water and landside. • Proposed fill material will be used for beach nourishment to add protection for Town property and pump station. • Fill material composition is listed as one-hundred percent (100%) sand. • Existing conditions site plan and overall project layout are provided. • No tidal vegetation is proposed for the site. • A sixty (60) linear foot aluminum gangway is proposed. • Proposed revetment structures to be total one-thousand and ten (1,010) linear feet, composed of three (3) inches of diagonal bedding, and one-thousand to two-thousand five hundred (1,000 – 2,500) pound weight of unspecified Class stone used for the armor. The board chair, Ann Hayward Walker was absent, so vice-chair Russ Dunton held the gavel. Dunton began by stating that only the specifics of the application would be entertained and that any public comments be relative to the present application. However, after closing the public comment phase of the meeting, Dunton quickly went rogue, attempting to bully the applicant into performing work well outside the scope of the application, as well as being outside the purview of the Wetland and Dunes Board itself. As was mentioned in the application, some dredging would take place. The applicant needs some of the sand to replenish the beach area near the west end of the dock. Dunton raised the concerns that more sand could affect the VDOT outfall pipe at Bay Avenue. Over the years, the sand movement has periodically filled the pipe, causing backups and flooding in town. 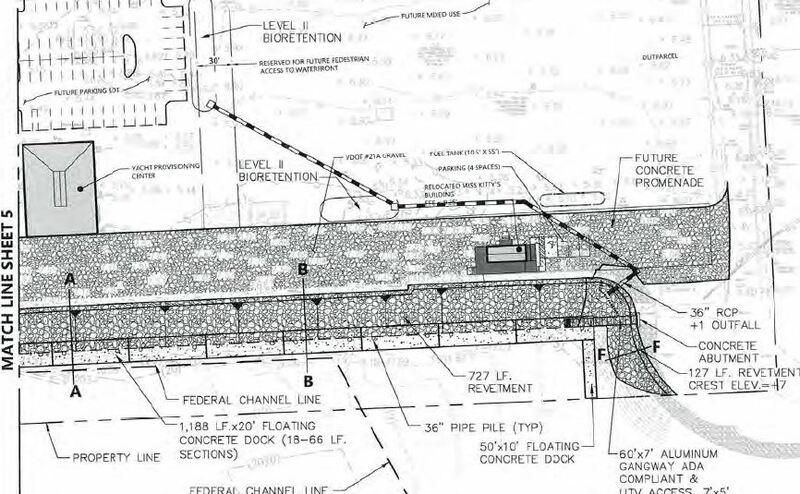 While the applicant can build the dock by right, board member Joe Fehrer commented that it was a private project that could affect the public property. Dunton then suggested that the sand should be hauled from the dredge site in the harbor all the way to the North end of the beach. This part of the beach is experiencing erosion and could use replenishment. It also should be noted that the town had the option in the past to fill in that portion of the beach but declined to do so. The board then attempted to add hauling the sand to the north end as a condition to approving the application. The only problem is that sand and beach building and replenishment is outside the purview of the Wetlands Board. Addressing a member of application team Eyre Baldwin, Dunton said, “Eyre, you may not realize it, but as a board, we are here to do what is best for the town.” However, the Board’s wetlands jurisdiction is for non-vegetated wetlands which lies between mean low water and mean high water. Vegetated wetlands jurisdiction is from mean low water to an elevation one and one-half times the mean tide range. They have nothing to do with sand on the beach. “This is all news to us. The town always does this. We have been through all of this application for weeks, and then you drop this on us in the meeting. It does not have to be a condition for approving,” Baldwin said. It became clear that this was merely a government entity attempting to bully the private sector into doing its work for them. Finally, interim town manager Larry DiRe made it clear that the construction was by right, and the board could not compel the contractor to move the sand to the north end of the beach. The motion to compel the applicant to move the sand was withdrawn, and new motion to accept the application as is was put forward. However, when asked for a second, none came. Although he could not articulate a reason, board member Fehrer seemed to still have a problem with the application. This went on for another fifteen minutes until DiRe reiterated the zoning principles at play. Eventually, a second did come, and the board approved the application. They did add a note, requesting that town council attempt to compel the contractor to put the dredged sand at the north end of the beach. Plans and diagrams provided by VHB. If the Baldwin’s don’t want the sand they could allow the town to use their dump truck and backhoe to move the sand. Seems like it was very short sighted not to have the Corp of Engineers to deposit the excess dredge sand 2 years ago on the north beach. But then one of the B&B,s made a big stink and had the beach replenishment stopped. Why did the Town Council act on the opinion of one interest group instead of having a town referendum? Looks like business as usual in ole Cape Charles. Pandora’s box was opened years ago and a town council that want’s to close it is powerless. Here Chick. Chick, Chick…..Here Chick, Chick, Chick…..chick, chick, chick!